BANDSAWS have a reputation for being one of the most dangerous pieces of equipment in use in any meat processing, meat-cutting or wholesale/retail butchery establishment. But just as it is now doing in so many other fields along the red meat supply chain, technology is providing workplace health and safety solutions which take operator safety when using bandsaws to a whole new level. Demonstrated in Brisbane for the first time recently was a latest-generation bandsaw with advanced safety features developed by New Zealand machinery vision and automation technology company, kanDO Innovation. kanDO is responsible for a series of highly innovative food processing solutions now in use worldwide. Just one of those is automated equipment for opening and processing mussels and scallops, providing huge labour savings for the shellfish industry. The video of this robotic process is impressive to watch, as the unit firstly aligns each mussel coming down the line in the same direction, and then precisely finds the hairline gap between each side of the shell, to open it. Given the widespread use of bandsaws across meat processing and retailing worldwide, the company has more recently turned its attention to developing its Guardian bandsaw system, which provides multi-layered protection from injury for operators. To start with, kanDO spoke to bandsaw users to determine what they liked and did not like in existing saws. Tethering was one feature they did not like, as well as torturous blade-changing, and difficult cleaning. While there are already saws on the market which detect hand contact with the blade, and apply rapid braking systems to minimise injury, Guardian has developed a ground-up design which supports a host of new and improved features. The Guardian system relies on multiple approaches to danger detection, when a hand approaches the blade area. The primary method is a vision system, which uses a series of four cameras to ‘shroud’ the entire working area, within 40mm, from all angles, when a hand approaches. Existing vision systems only offer a much narrower monitoring area, immediately in front of the blade. The four cameras work a little like an insect’s compound eye, providing a combined three-dimensional image of the ‘red zone’ around the blade area. It also provides added safety when a hand is above the work-surface, rather than resting on it. The vision system operates on the contrast seen in a blue working glove, against the background colour. The cameras work on extreme high speed. Even a glove thrown at the blade through the air will trigger shutoff, well before it reaches the blade itself. A second, optional feature on the Guardian saw is a contact sensing technology, using a dual-channel system monitoring both the left and right hand using an electrical circuit provided by tethering. The saw blade itself, travelling at 37 metres per second, can be stopped in milli-seconds, once a visual or contact sensing detection is triggered. Re-setting after a triggering incident takes just seconds, with no damage to the blade. While some users want the ‘failsafe’ security of a two-level safety system, there are Guardian units currently in use using only the three-dimensional vision camera safety system, that have been used for long periods, with multiple operators, without incident. 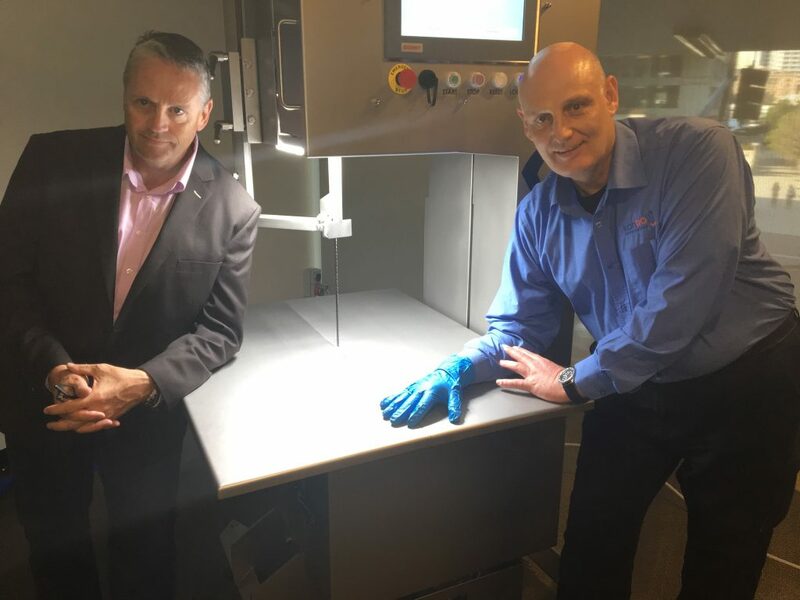 Guardian Bandsaws director Keith Blenkinsopp (gloved hand) with FPE’s Greg Bulluss, at last week’s Brisbane trade demonstration. Another significant advance in the Guardian system is in feedback and training. Because the system uses an industrial PC to manage the vision processing function, a software portal has been developed, delivering reports about the time of every tripping incident, who was logged on at the time, and a short video is available showing the circumstances of each tripping. It will also report productivity with the number of cuts per hour and for each blade. Graphs can be generated showing tripping results plotted over time. All the information can be accessed remotely, via PC or smartphone. This becomes a valuable workplace health and safety training tool. Each approved user logs in to use the saw, using an individual pin number. “It allows management to see habitual behaviours that might emerge when staff are working on the saw, and do something about it,” a Guardian demonstrator told last week’s Brisbane demonstration. It also allows managers to build up valuable hard data about fatigue and other operational issues, and how long staff should be manning a saw before rotation. Previously some companies using bandsaws have gone to the trouble of installing cameras in the ceiling, to try to monitor bandsaw use. The Guardian’s robust, stiff design removes flex in the blade, is much easier to clean, and makes it much easier and simpler to change blades, when required. Because of the process used to stop the blade following a tripping incident, there is no damage caused to the blade itself, and virtually unlimited tripping incidents can occur without the need to replace the blade. It also has push-button blade tensioning. Auckland Meat Processors was one of the first to adopt the Guardian systems in its beef and lamb chains. Click here to access the Guardian website. The Guardian systems are marketed in Australia and New Zealand by processing equipment supplier, Food Processing Equipment.